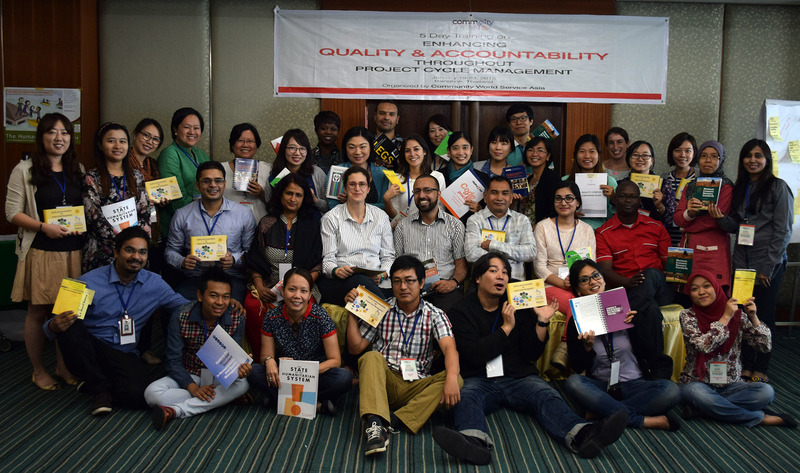 Community World Service Asia held the second joint standards training, ‘Enhancing Quality and Accountability throughout Project Cycle Management in humanitarian action and non-emergency,’ in Asia from January 19-23, 2015. Thirty participants representing 21 organizations from thirteen countries attended the five-day training in Bangkok, Thailand. The training was designed and facilitated by Sylvie Robert and co-facilitated by Community World Service Asia’s team member, Rizwan Iqbal, and Go Igarashi from Association for Aid and Relief (AAR) Japan. The main quality and accountability initiatives were introduced to participants which helped them understand the significance of linkages between various standards. With the launch of the Core Humanitarian Standard (CHS) and an increased pressure on agencies to adopt joint standards, the training provided an opportunity to identify key quality and accountability initiatives. Participants were able to select existing quality and accountability tools unique to their context and apply them throughout the project cycle, from the initial assessment phase, through the implementation, and finally the evaluation and learning phases. The training also assisted participants with opportunities to collaborate and coordinate with other agencies to improve quality and accountability in humanitarian response. This was achieved through various participatory learning and sharing methods, and a resource kit for each participant helped enable analysis of existing tools with fieldwork. An active methodology allowed for creative learning and sharing throughout the training. Through a specific group activity, participants identified the implementation of quality and accountability initiatives by sharing examples from the field. Work in pairs formed after a brainstorming session allowed the groups to prepare short presentations on some quality and accountability initiatives and deliver those in plenary to share information with their colleagues. Participants benefited from various types of practical exercises, such as a case study and a field school (real life exercise) to explore and understand the use of the quality and accountability tools in distinct contexts as well as the crucial need to select and adapt them. Presentations on key approaches such as the rights-based approach and accountability to beneficiaries, as well as on more transversal themes including disaster risk reduction and management (DRRM), resilience, and the link between relief, rehabilitation and development (LRRD), enabled participants to deepen their knowledge and share experiences from the region. As the training concluded, participants agreed that a need exists to increase knowledge on quality and accountability approaches, initiatives, and tools in preparedness to ensure its effective use at the time of a disaster. The participants highlighted the need for future training on: Core Humanitarian Standards; training of trainers (ToT) on Sphere, quality and accountability, and complaints response mechanism (CRM); and separate training on each of the quality and accountability initiatives. Participants were encouraged to collaborate with other agencies to improve quality and accountability in humanitarian action and agreed to seek future coordination, information, ideas, and other requirements.